Wednesday is farmers market day in White Plains. Usually this means I take my lunch break and go wander up and down Court Street trying to figure out what I want to make for dinner that night. This time a sign that said Red Kale caught my eye. It was more like purple kale, but I figured, I had to try this. As I was walking back to the office, I had it in my head that I was just going to saute some kale and scramble it in with some eggs. Simple. Then later, I thought about baked eggs. To me, whenever I saw a recipe for baked eggs, it usually had some spinach, meat and an egg in a ramekin and baked until the egg was set. That’s something different. 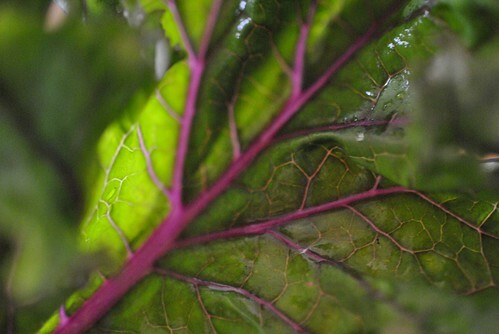 So, instead of spinach, I’ll just use some of this red kale. Now, when I cook on the weekdays, I cook willy nilly and just toss stuff together and hope it works out. This is no exception, which is why I have no quantities or measures specified. Just eyeball it, wing it, and do what feels right. It almost always works out and will be amazing. If not, oh well, at least it gets the job done (it’s something to eat). First, I prepped the kale. I ripped off the leaves from the stems and into bite sized pieces and washed the pieces. I also minced a clove of garlic, and cut up four slices of bacon. I melted some butter and brushed the bottom and sides of a 9″ cake pan with the butter. Then I lined the bottom with some bread and set it aside. I preheat the oven to 400 degF, and I tossed some chickpeas (canned, drained) in some olive oil, salt and pepper and threw them into a pan. 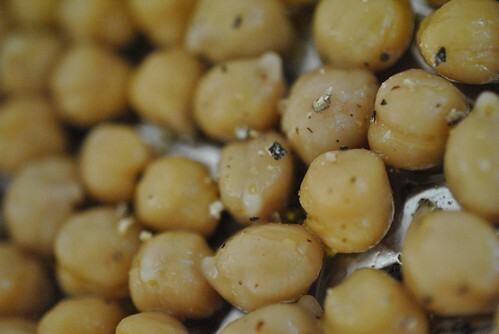 Once the oven came to temperature, I put the chickpeas into the oven to roast them a bit. About 10 minutes. In the mean time, I sauteed the kale. First, put the bacon into the cold pan. Put the pan over medium heat and cook the bacon until it is just about crispy. Toss in the garlic and cook for just a minute. Then put in the kale and saute until the kale is wilted. Remove from the heat. 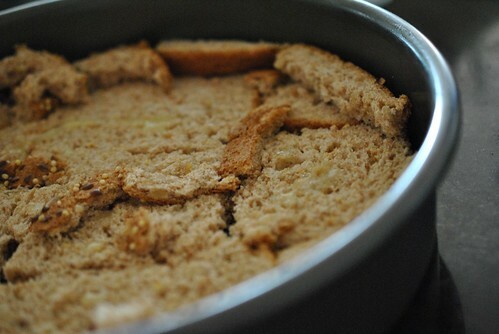 In the cake pan with the bread, drizzle about three to four tablespoons of heavy cream over the bread. Layer the sauteed kale and bacon over the bread. 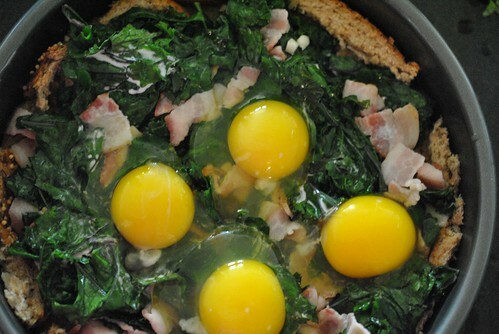 Crack four eggs on top of the kale. 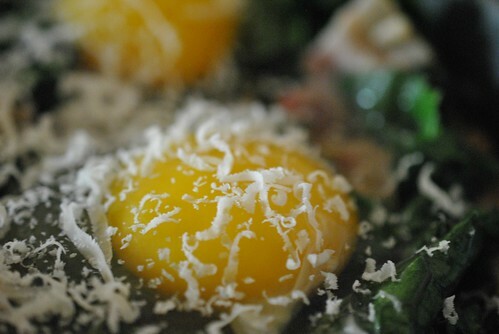 Grate some Parmesan cheese over the eggs and put into the oven until the eggs are set (about 20 minutes to half an hour). Once out of the oven, let it sit for about five minutes. It should be able to slide right out of the pan onto a plate. Cut up into quarters and serve with some chickpeas. Easy Peazy right? 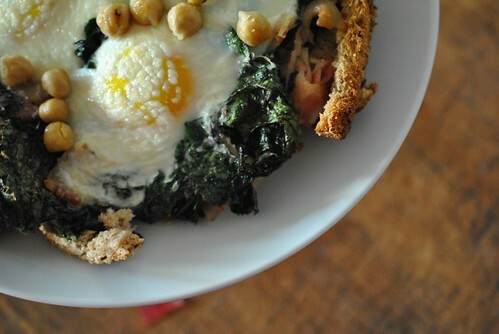 It’s kind of like a breakfast pizza. The bread crust toasted up in the pan with the heavy cream had an almost french toast characteristic to it. 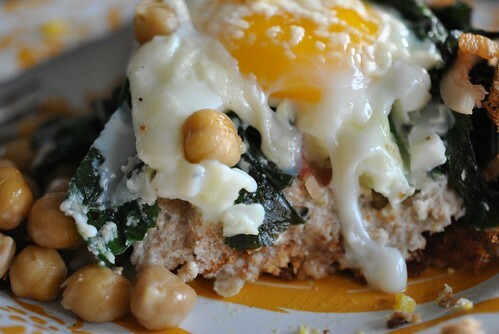 The kale, bacon and egg topping made it like a savory french toast. The chickpeas were a lovely addition and rounded up the meal. Totally tasty right out of the oven, but also pretty decent as lunch leftovers. 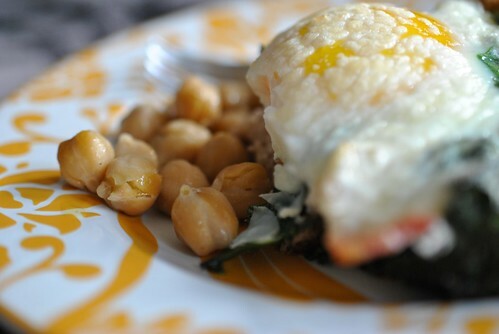 This entry was posted in Dinner and tagged baked eggs, chickpeas, farmers market, Kale. Bookmark the permalink. This sounds fantastic. 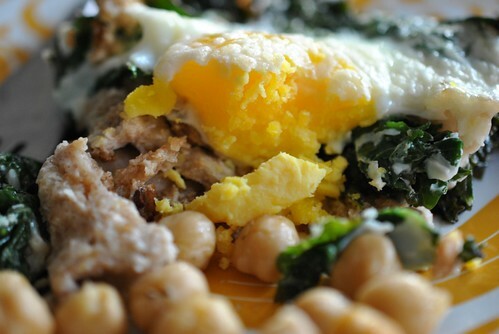 I might forego the bread for potatoes or something, but I love the addition of the chickpeas too. Haven’t tried purple kale, but I enjoy the green version! Potatoes are a fabulous idea! A crisp potato crust…yum!